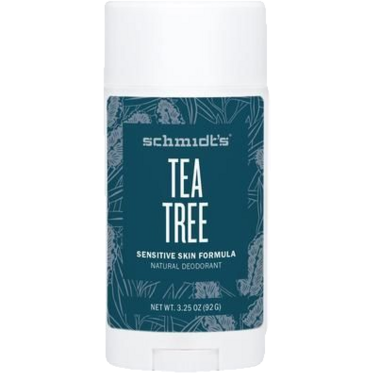 Schmidt's Deodorant Tea Tree Sensitive Skin Deodorant has the famously medicinal qualities of Tea Tree that effectively eliminate bacteria and prevent the spread of odor while soothing sensitive skin. Antiviral and skin-healing qualities round out this staple deodorant. One word "fantastic", so hard to find a natural deodorant that works .. Schmidt's brand has got it! All of their deodorants are great, I love the Tea Tree because it is smooth, feels and smells great, but most of all it works!! I work out often .. So thank you Schmidt's! It keeps me dry for most of the day.. Nearing the end of the day I start to get a bit of a weird odor with this deodorant. My third Schmidt's deodorant that I've tried. My favourite is the Bergamot & Lime, but I bought this because I find their regular formulations can be irritating if I have just shaved. This is a lot more gentle, and people might prefer this one more as it is smoother - almost creamy? - and less "gritty" than their other deodorants. I don't mind the smell of Tea Tree, but others might. This deodorant did not work well for me. I do sweat a lot so I do have a hard time finding a good natural deodorant. When mixed with my sweat the odour was much worse than my sweat alone. I really like this deodorant. I used the tub of lavender sage before this one and was really glad to have a stick option. It doesn't work at the same level traditional sticks do, but without all of the chemicals it is definitely worth the compromise in my opinion. It stops any body odour on hot days. I had to try this one after my Schmidt baking soda deodorant started irritating me. It works pretty well, perhaps just not as good as the baking soda formula for me. I have tried many aluminum free deodorants and haven't had much success. I am allergic to baking soda and I have found it hard to find a product that is aluminum free without baking soda. This stuff is gentle on my sensitive skin, it goes on smooth, it has a very mild scent, and best of all it last all day long! I originally bought this from my local health food store, but have found it to be significantly cheaper on well.ca. Thank you for providing wonderful products at a great cost! Great product, works very well without the irritating baking soda. The slight scent is hardly noticeable. I have been through so many natural deodorants - I think I find one .. and then ... my armpits break out, apparently I am allergic to baking soda (same for a large number of people trying natural deo) I HAVE FOUND ONE. I will buy this over and over again. The stick is actually so dense it will last quite a while. And the scent is lovely and mild enough - the most important part is .. it works ! !